From the opening, Alondra Nelson had me thinking about links between her work and African American literary studies. On the first page of her book The Social Life of DNA (2016), Nelson mentions Alex Haley's Roots (1976), which was broadcast as a television miniseries in 1977. And then, in the introduction, Nelson writes about Venture Smith, who was known for his book A Narrative of the Life and Adventures of Venture, a Native of Africa: But Resident above Sixty Years in the United States of America, Related by Himself (1798). Marilyn Nelson's volume of poems The Freedom Business (2008), illustrated by Deborah Dancy, also contains Venture Smith's narrative. I thought about Marilyn Nelson's book as I was reading Alondra Nelson's descriptions of an event in Connecticut in July 2006, when a British Broadcasting Corporation crew were filming a documentary on Smith. For Marilyn Nelson, the ex-slave was an important poetic muse. 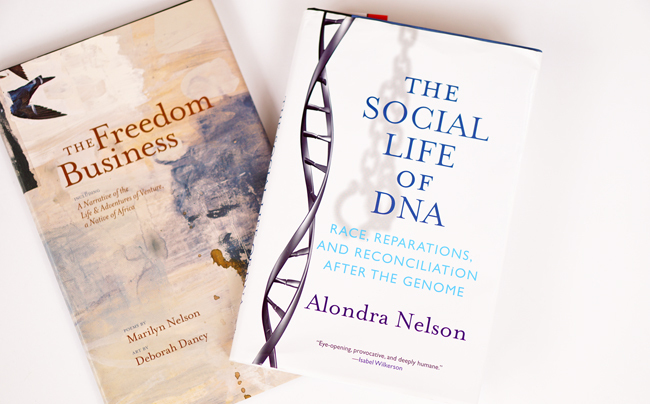 For Alondra Nelson, Smith was a touchstone to consider the social life of DNA. Often, literary scholars and historians produce works about the narratives and experiences of enslaved people. So I took notice that the poet Nelson and the sociologist Nelson were making these distinct contributions to the conversation. In The Freedom Business, Nelson presents a series of poems in the persona of Venture Smith. Over the last several years in particular, many African American poets have produced full-length volumes or series of poems focusing on enslaved people--tribute poems and persona poems. The Freedom Business stands out among various other works based on the ways that Smith's narrative appears on even-numbered pages and Nelson's poems (in Smith's voice) appear on odd-numbered pages. This hybrid production of late 18th-century slave narrative and poems by a contemporary poet is uncommon and powerful. In The Social Life of DNA, Nelson summarizes Smith's narrative and reveals that the ex-slave's "present-day relatives have extensive knowledge of their ancestry," having worked with a historian "to document ten generations" of the offspring of Venture and his wife (3). Nelson further notes that "Smith's descendants have sketched out a tall and broad family tree that begins on the African continent and branches to the present. In fact, Smith progeny hold the enviable position of having more information about their ancestors than most of us could ever hope to know about our own" (3). Despite the known facts of Smith's life, the notion that scientists, social scientists, and documentary producers were on a "quest to corroborate [Smith's] personal narrative with scientific evidence" raises questions about the social power and social life of DNA (7). Nelson's and Nelson's writings pushed me to think about Venture Smith and by extension various other ex-slaves beyond conventional historical frames.